Crataegus crus-galli leaves and thorns. By Arthur Haines. Copyright © 2018. New England Wild Flower Society. gobotany.newenglandwild.org (Accessed 2/018). Crataegus crus-galli is a small thorny tree to 10 m, roots associated with ectomycorrhizal fungi (Dickinson 1985), bark dark, scaly, densely branched, widely spreading, crown to twice as wide as tall, often multistemmed from trunk damage, stems of two kinds; vegetative long shoots, with internodes 2-4 cm, forming principle stems, and short shoots with internodes mostly 0.2-1 cm, forming lateral branches, flowering stems, or often modified as thorns 3-7 cm long. Short shoots expand only one flush of leaves from preformed buds. 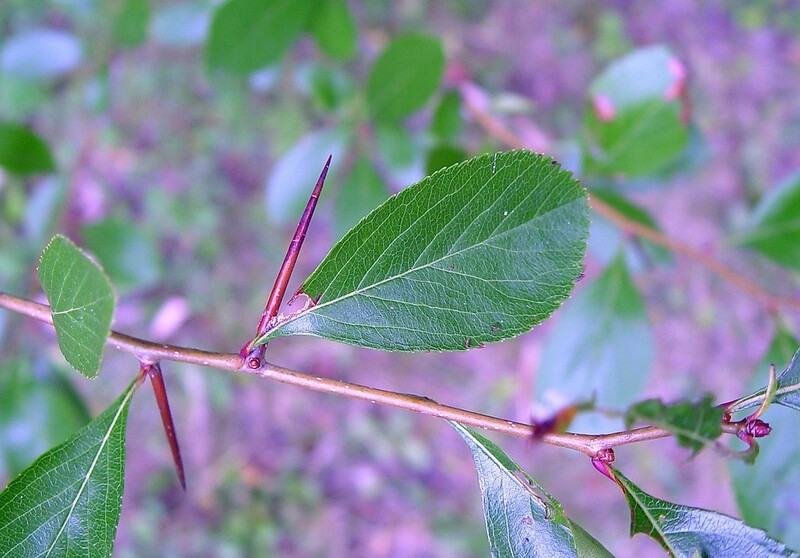 Those forming thorns elongate, loose their leaves and harden. Stipules deciduous. Leaves alternate, hairless, tip pointed to rounded, base tapered to stalk, margin finely toothed, glossy dark green above, paler below, those of flowering stems to 6 cm long, 3.5 cm wide, often widest above middle, long shoot leaves to 9 long, 8 cm wide, sometimes lobed, stalk 0.3-2 cm; leaves expand mid-May (Britton 1874). 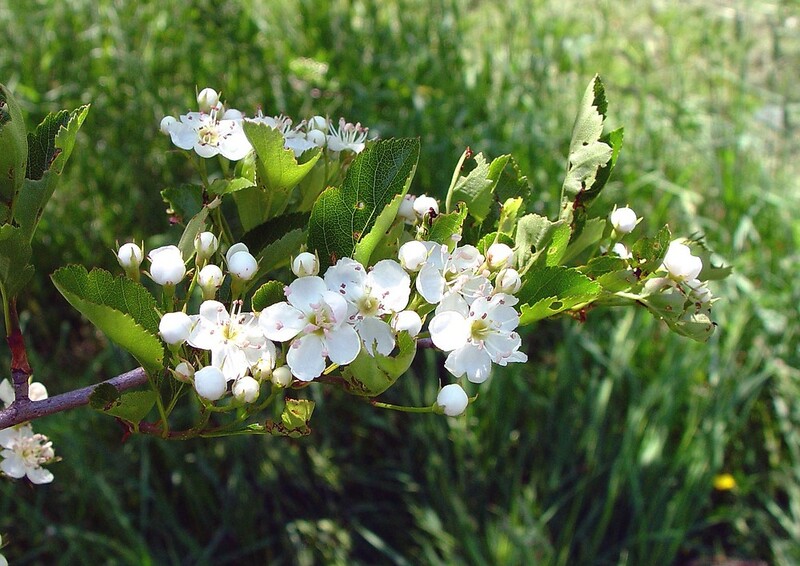 Crataegus crus-galli flowers. By Arthur Haines. Copyright © 2018. New England Wild Flower Society. gobotany.newenglandwild.org (Accessed 2/2018). Flowers white, 0.8-1.8 cm wide, petals 5, calyx 5 lobed, anthers red, pink to pale yellow, in lax clusters of 10-30. Blooming after age 5-10 years. May be self- or cross- pollinated. Most likely pollinators are Apis mellifera (honey bees) and Bombus vagans vagans, other insect visitors include Trichiotinus piger (Scarabaeidae, scarab beetles), two soldier beetles (Cantharidae); flies in the families Syrphidae, Sarcophagidae (flesh flies), Calliphoridae (blow flies), Musidae and ants, all of which feed on nectar. Seed also produced without fertilization (apomixis) (Dickinson 1985; Allaby 1998). 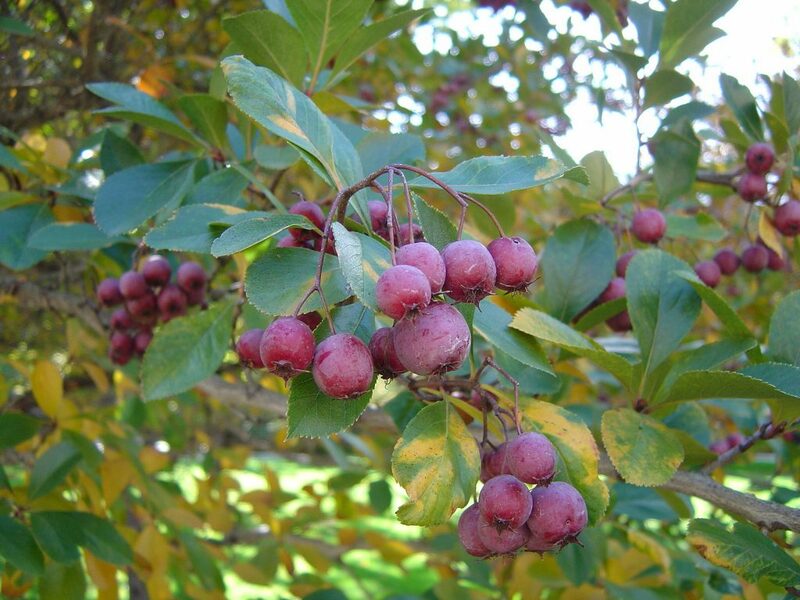 Crataegus crus galli fruit. commons.wikimedia.org (Accessed 2/2018). Fruit greenish to red, 0.6-1.5 cm, hard-fleshy, 1-2 seeds; fruit eaten by birds and mammals that disperse the seeds. Frequency in NYC: Very infrequent in NYC. Usually in overgrown horticultural plantings or planted along highway margins. Occasional in the metro region. (Clemants 1999). ). Habitat: Intolerant of shade, prefers moist, fine soils of flood plains, forest edges.